The culinary journey of chefs team Onno Kokmeijer and Arjan Speelman started around 15 years ago in Ciel Bleu: “We were given carte blanche to set up a top class restaurant and we seized this opportunity without the least hesitation.” The two-star restaurant on the 23rd floor of Hotel Okura Amsterdam was awarded its first star in 2005 and was awarded its second Michelin star just two years later in 2007. Together with chefs Onno Kokmeijer and Arjan Speelman, the following chefs prepared the 10-course menu for the Chefs Favourites: Arnout van der Kolk of Restaurant C, Dennis Huwaë of Restaurant Daalder, Vito Reekers of Restaurant Karel V, Thibault Casasole of Le Bistrot des Alpes, Marc van der Tang of Restaurant Den Burgh, Thomas Groot of Restaurant 212, Sander Spruijt of De Burgemeester* and Jelle Conijn of Ciel Bleu Restaurant**. The matching wine menu was composed by sommeliers Noël Vanwittenbergh and Sietse van Zanten and the restaurant team was led by Pasquinel Kolk, who was supported by talented former colleagues from the Ciel Bleu service team. 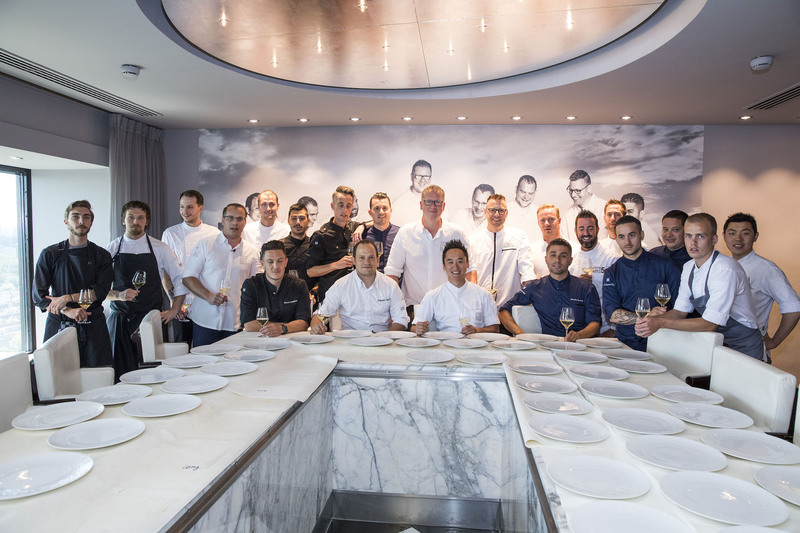 Ciel Bleu Restaurant, located on the 23rd floor of the Hotel Okura Amsterdam, has had two Michelin stars since 2007 and is part of the Alliance Gastronomique. The restaurant boasts three SVH Masters: Master Host Pasquinel Kolk, Master Sommelier Noël Vanwittenbergh and Master Chef Onno Kokmeijer. The restaurant has a separate lounge area with a fireplace. The ‘Chef’s Table’ next to the kitchen is available for exclusive bookings for up to 10 guests. ‘Starlight’ offers private dining options for groups of 10 to 24 people.